Some would say 'There's nothing to beat a good foot soak'. Abraham Lincoln is known to have said 'I cannot think clearly when my feet hurt'. Something i think most of us would agreee with. A relaxing foot soak and taking care of your feet after a long hike or after a days shopping, or even a day working on the shop floor is something that we can all look forward to. As a bit of R.R.R. (Rest, Relaxation and Recuperation) it just can't be beaten. Of course a good relaxing walk along the white sand beach of some tropical island would not only do our feet good. Apart from a nice natural scrub the sand will defoliate, gently massage, and get the blood circulation moving nicely all over the feet and toes. The salts and minerals in sea water can be absorbed into the skin for a wonderful soothing and healing effect. A good foot bath and soak with the right additives will go a long way to easing the pain, relieving the stress and relaxing the whole body and the mind. However, not all of us have this opportunity, and if we did we certainly wouldn't need foot bath recipes. So for those of us needing some 'aching foot' treatment a good foot bath with added salts and minerals is the next best thing. Click on the link below to take you down the page to the foot soak recipe of your choice. One of the good things about a home foot bath or soak is the rewards far outstrip the cost. A few drops of your favourite herb oil or a spoonfull of bicarbonate or Epsom salts and some warm water and you are well on your way to a very favourable experience. foot corns then any of the foot soak recipes would be of value to you because it will soften up the skin and make the 'corn removal' a lot easier. A foot bath for sore or tired feet may not be the only reason to use this spa treatment. healthy toenails that you can be proud to show off. Use the open toed sandal more often, it all leads to a healthier cycle of events for your feet. We hope they may be of use to you and you will use them as often as your feet and toenails need them. A foot bath or bowl large enough to place both feet without them touching the sides of the bowl, and deep enough so that the water will cover the feet to just over the ankles. Soak the feet for 15 to 20 mins. The water should be at a temperature that is suitable to you, a temperature you find acceptable and warm enough to soothe. The Chamomile is naturally calming, it is used to relieve dry skin, it is also known to reduce nervous tension, anxiety and headaches. The Lavender is a calming and soothing anti depressant, it has anti fungal qualities which acts against Athletes foot, and is good for foot strains, sprains and muscle tension. The Dead sea salt is rather a special salt, up to ten times more concentrated than other salts, it is loaded with minerals like magnesium, calcium, potassium, bromine, sulfur- to name but a few. They clean, moisturize, soothe, nourish, and stimulate cell replenishment. Aromatic Dead Sea Salts heal cuts and are recommended for such skin conditions as: Eczema, Psoriasis treatment, Scaly skin, Allergic irritations, Seborrhea, and Skin rashes. If your feet are aching after a hard day on the shop floor, if they are starting to show real signs of strain and starting to puff up a little then you need to give them a break and use this wonderfully relieving foot soak. 2 tablespoons of Dead sea salt. Add the above ingredients to a bowl of warm water, 1 gallon. The feet should be comfortable in the foot soak bowl with plenty of room at the sides, front and back. The water should cover the feet nicely to just above the ankles. Soak for approx 15 to 20 mins. The Eucalyptus is a natural decongestant and deodorant, its oil is used for massages, it can soothe rheumatism and arthritis and is great for the skin. Peppermint is known to reduce fatigue, nervous exhaustion and it can reduce inflammation and relieve headaches. It is soothing to muscle aches and pains and has a wonderful invigorating aroma. Rosemary is a wonderful natural herb, which grows and thrives naturally in my garden in Andalucia, Spain. It is used for many things, when its oil is dropped into warm water its qualities include relief from headaches, mental fatigue, nervous exhaustion, and stress. It is also kind to the skin and soothing for sprains and strains. Remove from the water and pat dry initially, then dry between, under and around the toes. Relax the feet by resting them on an elevated cushion for 10 mins then powder the feet with a good anti fungal foot powder if the skin of the feet feel in good condition. Some peoples feet sweat more than others, it is the same with the odor. Try this relaxing and fresh foot bath to take away any bad foot odor and keep the feet smelling sweet. The Cypress oil is used as a natural deodorant and is also refreshing and often used to aid breathing and combat respiratory conditions. The Sage oil is drawn from a fantastic herb with great qualities including anti septic, anti fungal, anti inflamatory and also used to treat some arthritic and rheumatic conditions. The Sage oil is a powerful natural anti fungal and anti septic. It is also anti inflammatory and used in foot soaks to relieve pain from arthritis and rheumatism. The Rosemary oil is good for blood circulation, reduces pain from sprains and strains and gout. It is stimulating whilst also relieving stress. After a long run or a jog, after dancing all night long or simply after a nice long outdoor trek, whatever the exercise, your tired feet will need some TLC. You will too no doubt, so relax with a nice foot soak but first a little foot bath will help relieve any puffiness or swelling or bruising. Prepare a bowl of cold water, add 2 drops of tea tree oil, drop in a few ice cubes and rest both feet for 15 mins in the bowl. Remove your feet and pat dry, under, between and around the toes. Wait for half an hour before immersing your feet in the foot soak below. Add these ingredients to a bowl of warm water large enough to comfortably accept your feet without your toes or heels touching the sides. Soak and relax your feet for around 15 to 20 Mins. Remove your feet and pat dry, then dry around, under and between the toes. Epsom salts named after the place in England where it was initially found, a natural spa in the town of Epsom, Surrey. It is often used to treat not only athletes foot but many skin disorders and it is available worldwide. Epsom salt is in fact a naturally occuring pure mineral compound of magnesium and sulphate, readily absorbed into the skin to help restore the ph balance. It is known to relieve pain and muscle cramp, softens any rough skin and helps eliminate toxins from the body. It is also used to treat toenail fungus and athletes foot. 1 cup Epsom salt into a bowl of warm water. The bowl to be large enough to take both feet without scrunching up the toes and the water to cover the infected areas. Soak the feet for 15 to 20 Mins two or three times per day. pedicure now would be a good time as the toenails will still be soft from the foot bath and soak. Please click on this link for more foot soak recipes and some great skin care recipes and remedies. Use this as a good time for a slow foot massage, to really get the blood circulating around the foot and the toes. This half hour or so spent pampering your tired feet will work wonders, just you see. Skip back to Foot Conditions page. Help others by sharing your own recipe and keep our feet looking and feeling great. See how you can turn your hobby, your passion, your profession or your knowledge into a nice profitable, work from home business. Join others like yourself, help each other along the way in the fantastic and friendly forums and build that website. I did, and i loved doing it. Take a look, click on the picture. We have a steadily growing following and take pride in providing our readers with the best advice and products available. Probably the best foot cream on the market today. Softens the skin, even softens the hard skin on the heel. Use it daily, it works. Another great product by Nu Skin. Specially formulated to give the nourishment and treatment your feet need. Sothes and rejuvenates your aching feet after a hard day. 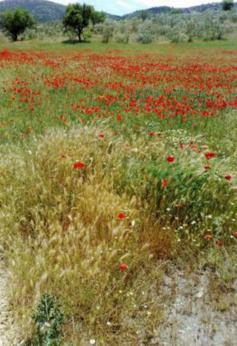 A poppy field in springtime, near my Cortijo in Andalucia, Spain. Click on the photo to see.